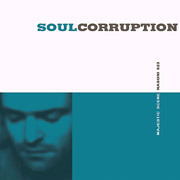 Majestic Scene - "Soul Corruption"
I had never heard of this quite excellent Dutch band from Tilburg. This is the bands fifth release and I am told all their material is quite different and diverse. This LP was released on lunar green clear vinyl. The band recorded the tracks in the rehearsal room and a studio in Eindhoven. The music has a special quality to it and is hard to place. There is a lot of variety on this record from pretty heavy rockers to jazzy things to pure mellow voice based ballads. I can hardly review the record as well as Jack Weinstock. I recommend going to the bands web page and reading the column on the left, where Jack describes this record in great detail. All I can say is the more you listen to this record, the more you appreciate what this band has to offer. For more information you can visit the Majestic Scene web site at: http://www.majesticscene.com.